In reality, sonnets 1 thru 126 were written to a man. They might have been composed for the gentlemanon the left --Henry Wriothesley, the Earl of Southampton. They were written in the months when the theaters were shut down because of the plague, and were dedicated to "his fair friend." The Earl was also his patron at that time. Another gentlemen, Robert Sidney, in a letter to John Harrington describes the dress he wore the day Elizabeth visited him....He was clad, he says, "in a rich band and collar of needlework, a dress of rich stuff and bravest-cut and fashioned with an underbody of silver and loops." 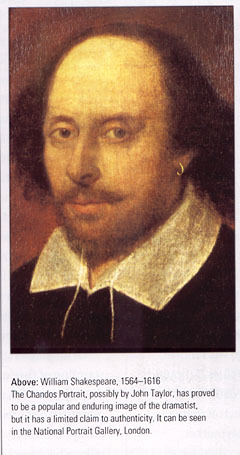 Men, almost as much as women, were given to the use of cosmetics, and were as vain about the cut and colour of a beard as they were about the cut and colour of doublet and hose. Harrison, in the middle of a "dry mock" on fashions in dress, drops in a "bitter taunt" or two about masculine beard- and hair-styles. "I say nothing of our heads" he remarks-with paralipsis worthy of Mark Antony--"which sometimes are polled, sometimes curled or suffered to grow at length like woman's locks, many times cut off, above or under the ears, round as by a wooden dish. Neither", says he, "will I meddle with our variety of beards" and then meddles delightfully. Some were "shaven from the chin like those of Turks"; others were cut short like that of Marquess Otto, or rounded like a "rubbing brush". Some had the "pique de vant", others were allowed to grow long. Barbers, on the whole, the parson says, were as cunning as tailors when it came to making a beard alter the shape of a face or cover some fancied facial defect. The long, lean, straight face could be made to look broad and large by a Marquess Otto cut. The owner of a 'platter-liken face need not be too unhappy, as a long narrow beard quite altered the flat, plate-like look. For the "weasel-becked", much hair left on the cheeks would make the owner look "big like a bowdled-hen and as grim as a goose.. These seem singularly unattractive alternatives; there can be little to choose between resembling a stoat or a barnyard fowl. Harrison, too, strikes the note that all this -- and all this included the wearing of earrings of gold set with stones and pearls -- is an offence to the Lord since men were attempting to amend the faces God gave them. ...The actor was a busy man with no time for elaborate rehearsing and, in an emergency, he could improvise at length. Italian actors were so brilliant at improvisation that provided they were given a story or plot they could make up the whole play as they went along. Audiences, unsophisticated in their tastes, loved high-sounding words and long speeches. Heros had to be heros, villains villainous. Terror must be a real physical thing. Tragedy was not muted nor was comedy polite. Playwrights knew what audiences wanted and gave it to them in full measure. Plays were stuffed with long speeches, rhetoric, classical and mythological allusions. 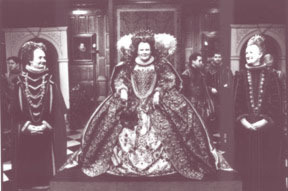 ...In fact the Elizabethans were really very like the Victorians in their passion for draping everything with something else--though of course their reasons were pleasure and ostentation, not prudery. Even that silly twin, Antipholus of Ephesus, in Shakespeare's The Comedy of Enon kept his ducats in a desk "Ucovered o'er with turkish tapestry". 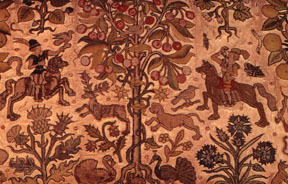 In the homes of the rich, cushions, bankers, table and cupboard carpets, were of tapestry, silk or velvet. The less rich made do with painted cloths or leather, and even the poorest homes were not without a threadbare tablecloth. Harrison, still full of wonder and admiration, says: "The walls of our houses on the inner sides ... be either hanged with tapestries or Arms work or painted cloths, wherein either diverse histories or herbs, or beasts, knots and such like are stained; or else they are ceiled with oak of our own, or wainscote brought out of the east countries whereby the rooms are ... made warm and much more close than otherwise they would be." Plaster walls were often painted with a running design or with figure subjects rather crudely if colourfully executed. A good example was discovered about thirty years ago at Stratford on Avon. It shows the Story of Tobit, complete with explanatory notes, the odd, in-between spaces being filled with strange fruits, flowers and foliage in the manner of William Morris. All the characters in this apocryphal Old Testament story are handsomely dressed in early Elizabethan clothes, while fluted Italianate pilasters separate the scenes which have little more perspective than Chinese painting. Colour was also used on wainscotted walls and to pick out ornamental details. The framework of wainscotting was often painted a brilliant red with touches of blue and gold while the panels were often decorated with designs and sometimes landscapes; or, instead, pictures were pasted in the panels and then painted. It was an age of such colour that we, accustomed now to subtler tones, are positively assaulted by it when we see a bit restored to its original brilliance. Jewel-like colours were also introduced into new houses through the big new windows which had such enormous areas for glazing that small panels of coloured glass were often let in. The arms of the family, scrolls, grotesques, Morris dancers, the inevitable strap-work, flowers, herbs and, loyally, the Royal Arms with supporters were often made up in coloured glass. There was some enamel-painting on glass too, while ventilation was afforded by ventilating squares of lead of a rather more restrained and geometric design; indeed, some of the clear-glass glazing- patterns were also almost reticent.